Price: USD$32.46 from Squadron Mail Order. Advantages: Clear colour photos, informative captions, superb detail coverage. The Albatros BII series was one of the main workhorses of the German Air Service. It was produced throughout the war years and eventually had seven manufacturers producing her. Taking over from the three bay B.I, the B.II proved to be a reliable and well-liked reconnaissance aircraft. The type was also used for training purposes and most of the pilots of the day would have had some experience in these machines. This is the first title in the Aero Photo Gallery series and what a great introduction it is. Taking advantage of preserved aircraft in the Polish Aviation Museum, and Swedish Air Force Museum, the publishers have produced a book to help the enthusiast and modeller alike understand their subject a lot better. No intact examples exist of the wartime B.II/B.IIa but fortunately a couple of licence-built post war machines survive and these form the basis of the publication. There are 56 jam-packed pages in this soft cover A4 sized monograph. The book starts with the 1919 built machine restored as Alb. B.IIa (Li) 1302/17 “AdA”. Note that this restoration has had the wrong year applied for “ADA”, i.e. 1302/15. One hundred and six colour photographs are devoted to this aircraft, showing close-ups of everything the modeller could desire. Strut attachments, cable pulleys, header tank pipes, cockpit, shock absorber cord…nothing escapes the photographer. While being sharp and clear, the photos are accompanied by some excellent, informative captions. This includes pointing out any subtle differences between the featured example and it’s wartime counterpart. A second chapter covers the Swedish SK. 1 trainer that was copied form the German Albatros B.II. This particular aircraft was built in December 1926. Another 70 colour close-ups are presented of this machine and again we are treated to the usual enlightening captions. 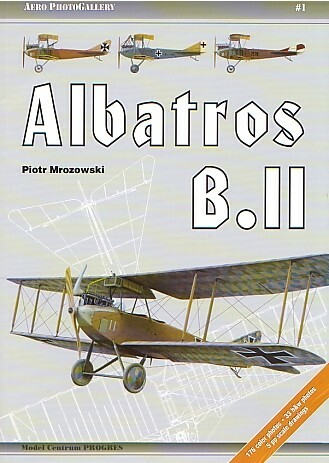 The book also contains a set of drawings for an Albatros B.II built by Linke-Hoffman Werke, Breslau. This Mercedes D.I equipped machine is produced in both 1/72 and 1/48 scales. The Polish Aviation Museum contains one of these engines that has been restored to running condition. A couple of photos of this motor are included as well. A final chapter provides a history of the Albatros B.II and includes 29 black and white contemporary photographs. These are printed mostly two per page with the occasional one being “full” size. One of the latter being the fascinating shot of the Zeppelin shed at Poznań-Winiary, housing no less than 47 of these airframes amongst the other types present. Four colour profiles complete the book, these being to the same high standard as the rest of the publication. The author has done an admirable job in presenting so much information in a book of this size. The detail shots of the museum aircraft are a modellers dream and the rest is just icing on the cake. Modellers should note that due to the many licenced manufacturers producing these machines, there were many differences to be found between aircraft. Thus study your prospective subject carefully.